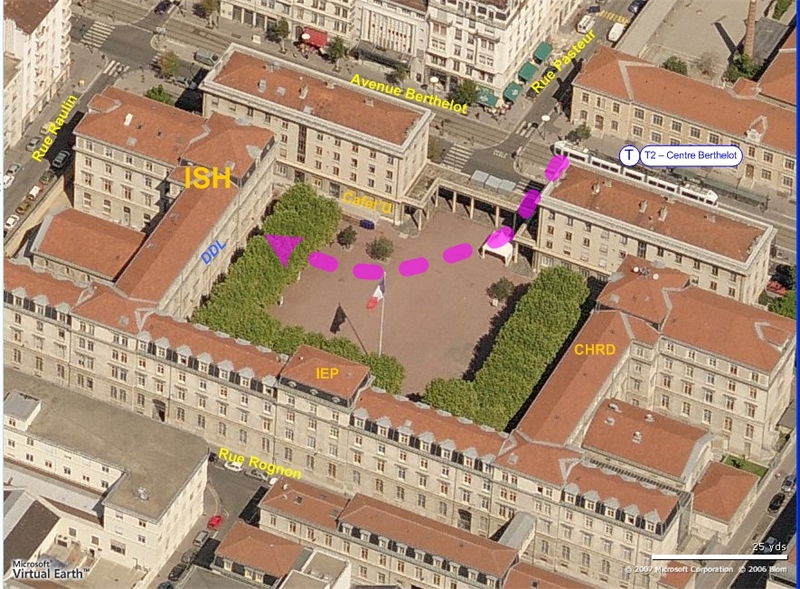 The DDL Lab is hosted by the Maison des Sciences de l'Homme Lyon-Saint-Etienne (magenta block on the map below) 14 avenue Berthelot in the 7th district of LYON. 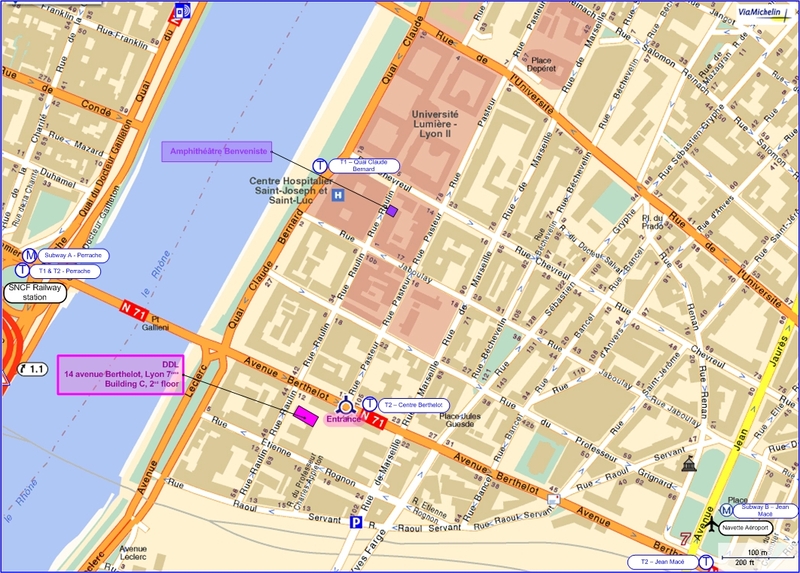 The BENVENISTE amphitheatre (purple block on the map below) is hosted by the MOM (Maison de l'Orient Méditerrannéen) 7 rue Raulin. Take the T2 tramway going to "St Priest Bel Air" and get off at the first stop: "Centre Berthelot"
You then just have to cross the avenue Berthelot, the entrance is in front of you (green iron gates). DDL is in the second building on the right. 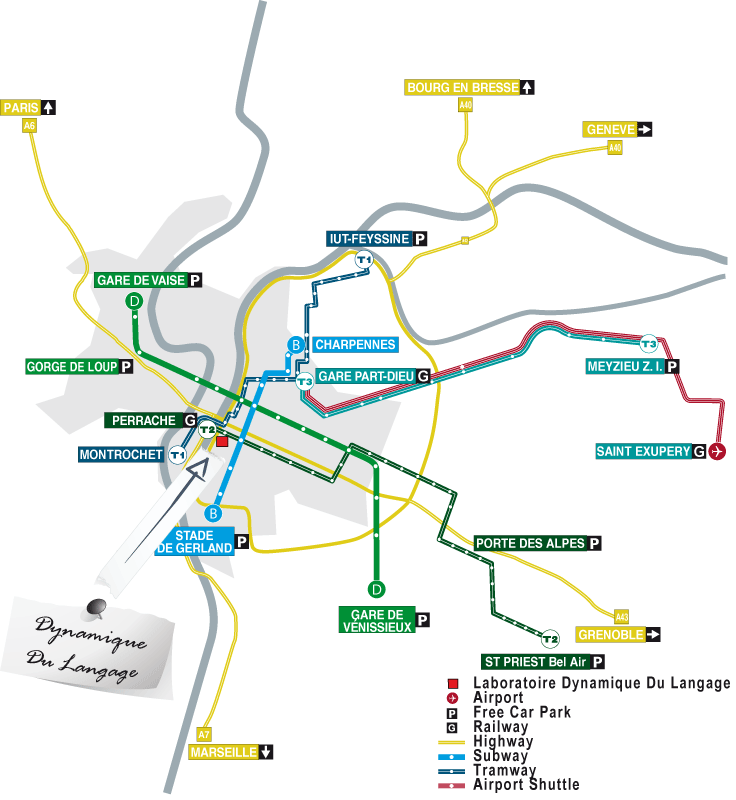 Take the train going to "Gare d'Oullins" and get off at the 3rd stop: "Jean Macé"
Take the T2 tramway going to "Perrache" and get off at the first stop: "centre Berthelot"
Note that the lab is 15 minutes walking distance away from "Perrache" railway station and about 7 minutes walking distance away from "Jean Macé" tramway stop. RhoneExpress shuttles link the Airport and the Part-Dieu Station. They run every 30 minutes from 5 A.M. to 6 A.M. and from 9 P.M. to midnight (11:30 P.M from Part-Dieu) and every 15 min from 6 A.M. to 9 P.M. The price is 13 euros (23 euros round trip). The travel takes about 30 minutes. You can plan your itinerary on mappy. Please let us know after your stay, where you stayed and if it was ok or not.